A team-up between rapper Drake and top Fortnite player Ninja has broken the record for the most people watching an individual's Twitch stream. More than 600,000 people tuned in to watch the pair play the survival co-op shooting game on the streaming service. Later on, the two were also joined by musician Travis Scott and NFL player JuJu Smith-Schuster. The event still fell shy of the overall record for the most people watching a Twitch stream, which is 1.1 million. That was set during the grand final of the Counter-Strike: Global Offensive in the 2018 ELeague tournament. But the Drake-Ninja collaboration is believed to be the biggest audience for a personal, non-tournament stream. Should you limit children's time on Fortnite? 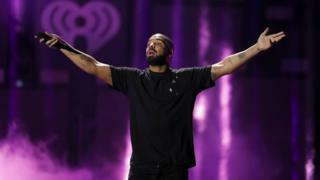 Ninja, also known as Tyler Blevins, had dropped hints about playing with Drake during the week leading up to the tie-up by regularly playing songs by the Canadian rapper while streaming. Speaking during the stream, Drake said he had been playing Fortnite for a couple of months and had used it during breaks from recording sessions to relax. During the downtime, Drake and other members of his band had also started watching Ninja via Twitch. Mr Blevins uses a PC to play Fortnite but Drake has a PlayStation 4, and the pair used the recently introduced cross-play system to join up. The pair played a variant of the game called "duo", which sees 50 teams of two take each other on to see who is last team standing. When Scott and Smith-Schuster joined, the team formed a four-man squad - 100 players take part in each Fortnite battle. The number of people who watched the stream grew substantially soon after Drake posted a link to his Twitter account for Ninja's stream. Drake currently has more than 36 million followers on the social network. "The reaction to this Twitch stream shows the power of mixing a major celebrity with a very popular game in a live streamed environment," said Piers Harding-Rolls, games analyst at IHS Markit. He added: "While most of the commercial attention has been concentrated on the potential for esports video, this example of live entertainment demonstrates the wider value of games content to the video (and music) industry." Fortnite has become one of the most popular titles watched on Twitch, outdoing rival co-op shooting game PlayerUnknown's Battlegrounds (PUBG). The popularity of the tie-up is a PR victory for Fortnite-maker Epic ahead of its launch of a version of the game on iOS and Android mobile devices. It also marks a significant moment for Twitch and game-streaming in general. In a related development, the British Academy of Film and Television Arts (Bafta) has just revealed that Fortnite has been nominated for two of its 2018 Games Awards. It will compete in the Multiplayer and Evolving Game categories, but missed out on the Best Game group.